I hope that you have been having a good time with the game. I have found some things that need clarification in the rules. Many were pointed out by the numerous friends and play testers around the country. The most basic rule of the game is to have fun so I always advise that racers should apply what seems fairest or makes the most sense as far as physics goes? When in doubt, have one person named the game leader at the beginning of the game and they have final say for that game. I will list some common questions I have received so far and their answers. What about the Bumping Modifiers? Are they to be used for both racers involved or just the defender? Both vehicles and drivers apply all modifiers to the bumping table. If both vehicles have some damage then it makes sense to apply that damage to the roll from both sides, right? What about the set up you use at the conventions? If you randomly determine turn order, there will be a lot of collisions the first turn, right? I’ve made the rule at conventions that no one can bump someone still on the starting line. It’s a race and you have to start down the track. You can opt for whatever rules you want to use for your own house games. What happens when a player’s racer hits a canyon wall and he/she fails the PR check(s) (per pg. 12 – collisions), is it destroyed? Roll 3 die-6 and apply the result on the bump table for each inch or partial inch on which they failed the PR checks. 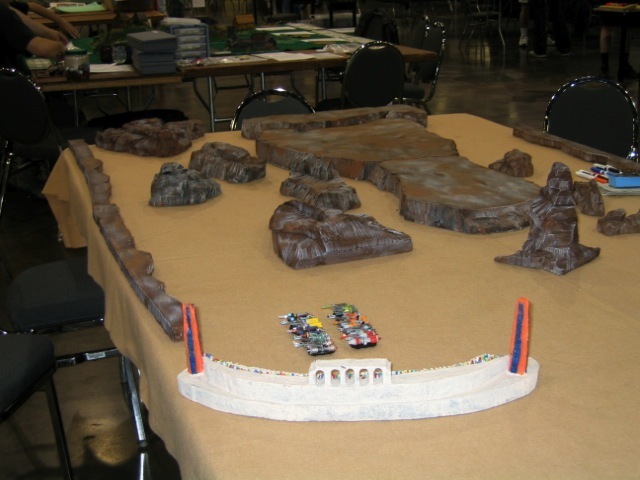 For instance, if a racer is destined to plow 4 inches through a cliff face and they only make the first two of four PR checks per the rules then they will roll twice on the bump table with 3 six sided dice, applying all existing damage modifiers to their roll. Remember to apply all damage to the vehicle and recalculate the modifiers from the first roll before rolling the second roll. This usually kills most vehicles but, anything is possible. If the racer survives this then apply all damage from the rolls and continue racing. What happens when any attribute reaches zero? When any vehicle or pilot attribute reaches zero, that racer is out of the race, either dead or too damaged to continue. Are the Future Race rules available for sale? While the first and second versions of the rules are currently out of print, there is still some demand for another upgrade to the existing rules with more information on the variations developed as well as tips to develop Future Race to your own favorite racing genre. Contact the author by email to get on the Future Race Games mailing list and you’ll be notified when the new rules are available, sometime around January 2009!